Not so very long ago, waste was a distinctly un-cool subject, something that no one really wanted to talk about – at least, not in public. How times change! Today, recycling, waste reduction and composting are everyday topics and just about everyone’s got themselves interested. So, in preparation for the next time you get involved in conversation – or sign yourself up for that “waste-aware” pub quiz – here’s one or two quick facts that you might find interesting along with a few funnies to raise a smile. We’re all so used to talking about waste and recycling these days, but for the most part we tend to think about it in terms of our own bins and what we do every week. Take a look at the bigger picture, however, and, as the following bits of trivia illustrate, that picture is very big indeed! In the UK, on average we each throw away around eight times our own body weight in rubbish every year – that’s more than 100 million tonnes of household waste in total. If all that waste was collected together, it would need a landfill site the size of Lake Windermere to hold it. The UK as a whole produces enough waste in two hours to fill the Albert Hall, while the waste produced in Wales alone could fill the Millennium Stadium every three weeks! Across the whole of the EU, around 3,500 dustbins of waste is generated every minute. The great British summer; the sounds of lawnmowers and the sizzle of barbecues – but that all adds up to a sizeable amount of green waste that needs to be dealt with somehow. The good news is, however, that it looks as if we’re doing alright; well, at least mostly. 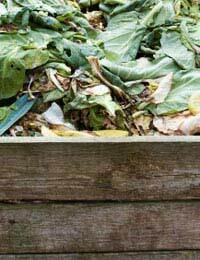 Garden waste makes up about a fifth of a typical British household’s waste and kitchen waste adds almost as much again. Incredibly, British households throw away over 8 million tonnes of food every year. According to the latest government figures for England, composting adds up to a third of all household waste recycling. Over 2.5 million tonnes of green waste each year is treated at centralised composting facilities. Saving energy isn’t just about changing light-bulbs and switching things off standby; how well we live up to the “reduce, reuse, recycle” mantra also has big implications for how much energy we use as a nation – and more to the point, how much we waste. Making steel from recycled materials saves three-quarters of the energy needed to make the same product from new. Recycled aluminium products use only one-twentieth of the energy required to make them from the original bauxite ore. Recycling glass saves the equivalent of 30 gallons of oil per tonne – and the consequent carbon emission too! Each plastic bottle recycled saves the same amount of energy as it takes to light a 60 watt light-bulb for about six hours. So what about the materials we throw away? All those cans, bottles and bits of paper certainly mount up, once you start counting them! Recycling every single aluminium can sold in Britain would mean 12 million fewer dustbins of waste a year. According to the aluminium industry, some 20,000 tonnes of foil is wasted annually – that’s a whopping £8 million-worth of aluminium just ending up in the bin! Each Christmas sees enough wrapping paper thrown away to cover the island of Guernsey. In Britain, we use more than 6 billion bottles and glass jars annually. Someone at Waste Watch calculated that it would take 3,500 years to sing “Six Billion Green Bottles” – should you want to! Finally, a quick-fire listing of the sort of snippet that leaves you wondering just who works this kind of thing out, how do they know – and haven’t they got a real job to go to? By the time a child is toilet trained, he or she may have gone through almost 5,000 nappies! The average British household throws away the equivalent of six trees in paper each year. If all the cans used in the UK each year were laid end to end, they’d reach to the moon and back! Just under a tenth of the average bin is made up of household sweepings. We need a forest the size of Wales to keep up with our annual appetite for paper. Each year, the average Briton throws away the equivalent of 1077 banana skins in organic waste. On average, we throw away around £100 worth of food per person every year. In 2003, the energy saved by recycling glass could have launched 10 of NASA’s space shuttle missions! One thing’s for sure, the topic of waste is well and truly out in the open – and there’s plenty to talk about.